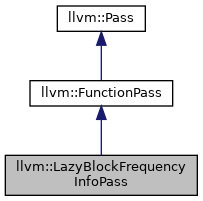 The difference is that with this pass the block frequencies are not computed when the analysis pass is executed but rather when the BFI result is explicitly requested by the analysis client. The computed BFI should be requested with getAnalysis<LazyBlockFrequencyInfoPass>().getBFI() before either LoopInfo or BPI could be invalidated for example by changing the CFG. Definition at line 100 of file LazyBlockFrequencyInfo.h. Definition at line 34 of file LazyBlockFrequencyInfo.cpp. 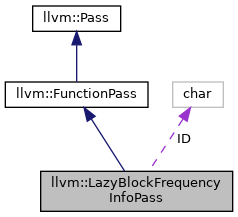 Definition at line 42 of file LazyBlockFrequencyInfo.cpp. References llvm::AnalysisUsage::addRequired(), llvm::LazyBranchProbabilityInfoPass::getLazyBPIAnalysisUsage(), and llvm::AnalysisUsage::setPreservesAll(). Definition at line 112 of file LazyBlockFrequencyInfo.h. Definition at line 115 of file LazyBlockFrequencyInfo.h. References F, llvm::initializeLazyBFIPassPass(), print(), llvm::LazyBlockFrequencyInfo< FunctionT, BranchProbabilityInfoPassT, LoopInfoT, BlockFrequencyInfoT >::releaseMemory(), and runOnFunction(). Definition at line 61 of file LazyBlockFrequencyInfo.cpp. Referenced by eliminateLoadsAcrossLoops(), llvm::InstructionCombiningPass::getAnalysisUsage(), and llvm::OptimizationRemarkEmitterWrapperPass::getAnalysisUsage(). Definition at line 38 of file LazyBlockFrequencyInfo.cpp. Definition at line 52 of file LazyBlockFrequencyInfo.cpp. Definition at line 54 of file LazyBlockFrequencyInfo.cpp. Definition at line 107 of file LazyBlockFrequencyInfo.h.